On May 6th Mariarosa from Scarborough wrote to tell us ... Around 10 pm I was walking my two small dogs on Prudential Drive, which is right next to the Lawrence East RT. Out of nowhere I saw what looked like a dog at first, running down the sidewalk towards us. As it got closer I noticed the pointed nose and realized it wasn't a dog at all, but a Coyote. My neighborhood has a small secluded park next to a large hydro field. It was strange the Coyote ran towards me and my dogs and then crossed the small road vanishing into the dark park. The entire time he never broke eye contact with me till he reached the park. As if he understood not to come near my pack. :) he was so agile and beautiful. My dogs reacted very differently to him then they usually do with other animals. Normally my dogs start barking and jumping, but I guess they realized it was a predator, because my dogs became very still and quite. They just watched as he ran past. Cathy sent us this report recently ... We frequently see Coyotes in the field behind our house. Most recently was Easter Monday, morning around 7:30 a.m. March 28, 2016, it appeared a bit larger than normal and had very distinct grey though out its coat. Most of the previous have been reddish brown in colour. He was just sitting in the middle of the field. I thought at first he was eyeing up a prey. I made a coughing noise and he turned and looked, however didn't get up. Again I coughed and he stood, looked and casually walked down the field. About 15 minutes later the neighbor took his dog out for a walk in the field and the Coyote passed right in front of him and dog very casually. He hollered a couple of times before it finally ran off. I live south of Highway #2 east of Belleville, Ontario. Point Anne Rd. goes directly to the Bay of Quinte. Fox, Deer, Coyotes, Osprey, are common to our area. Brenda from London wrote to say ... I live on Highview Avenue East in London, Ontario. A few days ago a neighbour lost his cat and found the fur of the cat near by his home. He heard the yipping of the Coyotes that same week. Then my cat disappeared a few days later and we live 3 houses away from the neighbour who lost their cat. I have heard the Coyotes yipping too but not lately. Coyotes have been seen by people on the walking paths in the woods behind us. They have also attacked and killed a dog and climbed a 6 foot fence to get the pet out of the owner's yard. A friend saw four Coyotes surrounding a rabbit and killing it from her balcony on Proudfoot Lane this summer. There is a fishing club in the Westminister Ponds area off of Southdale Road and they told me about four years ago that the Coyotes had killed off all the female Canada Geese and their babies while they were nesting and now only the male geese are there. Many people in London have seen Coyotes or the destruction they have caused. Some people think we are invading their space. I think they are wrong. The Coyotes are coming to cities because all types of wildlife live in cities because we have gardens, feed the birds, etc. Then that attracts larger animals like raccoons, squirrels, groundhogs, rabbits, mice, etc., then that attracts animals like Coyotes and eventually bigger animals like Wolves and Cougars will come to eat them. I think the Coyotes population is growing in cities because there are lots of readily available prey for them and our pets are now easy targets for them. The Coyotes have no predators to eat them in southern Ontario, so they will just keep expanding. We need to do something to stop their spread. anything more than a raccoon. I am still very excited, we were pretty respective, I didn't leave the area right away, but she watched from a distance until I went back to the side walk going through the park. I was surprised with the size, she didn't look much smaller than my dog, he's only 8 months old, but he is around 100 lbs. Not slim either, at first I thought it was a Wolf, she was more gray than red. Very healthy. I have a picture of the hole in the ground, but not on this device, very clever spot for it as well, the side of very step hill, and I can't imagine anyone going there, unless they wanted to take a picture of broken trees. We need more birch trees in natural areas. It was Park Lawn and Queensway area. I spotted her maybe 5 minutes walk away from the house, maybe not even that, but far from the sidewalk going through the park. Sharon Scott wrote to report ... On January 11th 2016 there was a coyote in Central Park in Hamilton, Ontario. I had my dogs and with the male dog he growled and the Coyote ran but with my female dog, the Coyote seemed quite curious running along the fence line while we were walking, stopping every now and then to sit and stare at us. I called SPCA, and was told it was not their job. They would send an officer to investigate and if the animal seemed aggressive, they would call the police to have the Coyote shot. I have not seen the coyote since but it was quite unnerving as well as beautiful. They truly do not belong in the city. It was hungry running around with garbage in its mouth, I left the park and it was trying to follow me out. I think what scared it was a man in a car who just stopped and the headlights scared it. One of our readers said ... I live in Bowmanville in the Baseline Rd/Green Rd area and I have heard Coyotes every night for the past 2 weeks - anywhere from 9 - 11 pm . Last month I also spotted a lone Coyote along Green Rd just past the train bridge, lurking close to the sidewalk beside the old run down farm. This was at 2 pm in the afternoon as people are out walking their dogs not far past the area. Please be careful...they are definitely not shy or afraid of cars driving close by or people these days. Amabel wrote to say ... We live in Brampton in a new neighborhood along Chinguacousy South of Queen. My backyard is overlooking a ravine and we have seen plenty of animals like turkeys and deer in summer. Most recently, this Christmas we got a sighting of two white Coyotes. We also hear the howling in the evenings. M Freeman from Oshawa wrote to report ... About 4 am my friends saw two coyotes on my driveway, just standing there. Before I had been advised of this sighting, I had gone to my car to go to work. I saw a large German Shepherd-type animal walking down the center of our road that is a dead end. I live on a ravine at Adalaide and Wilson Road. I have also seen large dog tracks in the snow in my back yard going to a shed that had raccoons at one time. I called the City of Oshawa but was given the run-a-round stating that we are in their territory (the Coyote's). Alex from Guelph wrote to tell us ... While coming back from Ice fishing, I saw a Coyote running in a farm field less than 200 meters from the southern boundary of Guelph. It was at 11 am on a Monday. It was alone but it looked like it was looking for another Coyote. 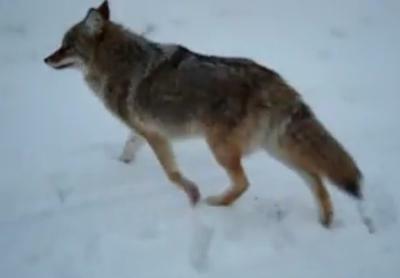 He was near a farm with cattle, so, it's possible that the Coyote was stalking them. Michael wrote to say ... On Saturday morning, May 7, 2016, in Windsor, Ontario, in the Spring Garden Area of Natural And Scientific Interest, my wife and I witnessed a Coyote. We were walking on the trail just south of Spring Garden Road when the Coyote intersected with the path a few metres ahead. It saw us, briefly paused, then retreated into the woods. Two joggers coming from behind us also remarked: "That wasn't a dog was it?" We replied "No." Heather from Whitby wrote to report ... I was out searching for a lost small black dog in the area when a Coyote crossed Cochrane and headed into the green space on west side of the road. At first I was not sure if it was another loose dog, but as I pulled over it stood in the green space long enough for me to get a look. After googling Coyote images I am quite sure that was a Coyote! I am now more concerned for the little black dog "Nero" I am helping to search for that was seen in the area last night. If anyone does see the black miniature Schnauzer (with a wee bit of brown on the chest) please contact the Team Chelsea lost pet group on Facebook. Thank you!